James Mackintosh was appointed by Treasurer Andrew Parker to transform the room into a very elegant well-proportioned space in a periodically sensitive way. An initial assessment revealed that much of the character of the room was defined by the fitted timber cabinets on either side of the fireplace, the green glazed tile fireplace surround and set of three plaques above the fireplace, which relate to the history of the College and include the date of Somerville Hall’s foundation and the birth year of its namesake. 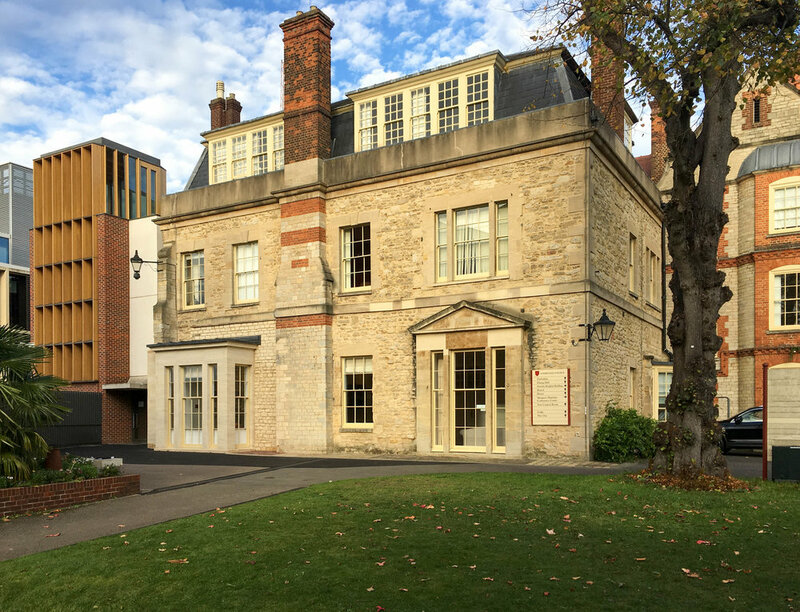 Walton House, was built in 1826 by Alderman Thomas Ensworth, and whilst the original use of the Mary Somerville Room is unknown, archival research uncovered several old photographs and drawings which provided evidence for the restoration. In 1879 Somerville Hall opened as a non-denominational college for 12 women. An increase in student number to 101 by 1914 was accommodated by a number of extensions: firstly by Sir Thomas Jackson in 1881, and later Walter Cave who extended to the north-east an also raised the roof of Walton House. In 1903 a new entrance was provided to the Mary Somerville Room as part of a scheme by Basil Champney linking the house to the Library. Walton House, new bay window. Mary Somerville Room, prior to restoration. Bespoke relief detail for plaster ceiling designed by Cliveden Conservation. Paint analysis by Catherine Hassall revealed that the original paint colour was a very dark masculine green – the tone was adjusted to an appropriate colour and to match the interior furnishings by Sophie Chorley of JT Interiors. One of the discoveries on site, was a pretty painted tiled fire surround dating to the mid-20th Century. Whilst the tiles were not part of the original scheme it was agreed that the new joinery would be designed around them. The building work was executed by Mark Copeland of ML Copeland building services, and managed by Chris Clover at Bidwells and Steve Johnson. The Mary Somerville Room has a renewed sense of elegance, suitable of an Oxford College interior, a classical re-presentation of its arts and crafts origins. The room was opened in 2018 and is used as a space for entertainment and recitals.